Wind damp bi syndromes characterized by weak or aching low back, painful joints with swelling, especially swollen knees or swollen feet. 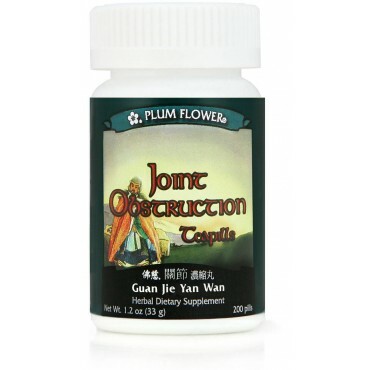 Sciatic pain, rheumatism and lower limb arthritis are some of the imbalances satisfied clients have used this product for. Coix lacryma jobi seed, Stephania tetrandra root, Atractylodes lancea rhizome, Erythrina variegata bark, Cinnamomum cassia twig, Achyranthes bidentata root, Evodia rutaecarpa fruit, Gentiana macrophylla root, Periploca sepium root-bark, Scutellaria baicalensis root, Angelica pubescens root, Zingiber officinale rhizome fresh, Activated carbon, Botanical wax, Talcum. - Yi yi ren, Fang ji, Cang zhu, Hai tong pi, Gui zhi, Huai niu xi, Wu zhu yu, Qin jiao, Xiang jia pi, Huang qin, Du huo, Sheng jiang, Activated carbon, Botanical wax, Talcum.